Microsoft Outlook blocks number of attachments based on different file formats for security reasons. By default it block files of different formats or extensions like .exe, .url, .reg files. At times, you need to read or access those files and even forward them to your friends using Outlook. 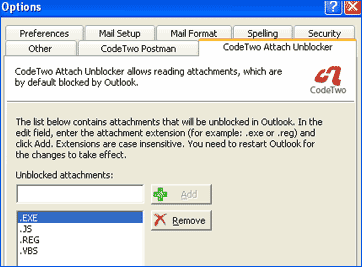 CodeTwo Attach Unblocker is a free utility that allows you to unblock any type of file being blocked by Microsoft Outlook. Using this utility you can read any blocked attachment file in Outlook by configuring allowed file types in Outlook. After you install this utilty, goto Tools > Options in the Outlook menu and go to the CodeTwo Attach Unblocker tab. Add the list of file extensions that should not be blocked as seen in screenshot below. Restart Outlook and you will able to access attachments previously blocked in Outlook. Download CodeTwo Attach UnblockerÂ [0.6MB], it works with Microsoft Outlook from 98 – 2007 and supports Windows 2000, XP and Vista. Please note, Outlook blocks few file attachments due to security issues. Unblock files or file extension only if you are sure about blocked file – use discretion!